You might not have a refrigerator in your RV. You likely have looked at portable refrigerators that might be too small or don’t have the power to stay cold if not hooked up to a power supply. But thankfully, there are 12-volt refrigerators available for purchase. These refrigerators run one 12-volt batteries so that your food can stay cold while off the grid. These are powerful refrigerators that are shaped like coolers, but also have a lot of room to spare. In this review, we will take a look at five wonderful 12-volt refrigerators from companies such as ARB, Midea and Whynter. Each fridge has its share of strengths and weaknesses that you need to know about. We will then show you to the best 12-volt fridge for your investment. Comes with a wire basket. 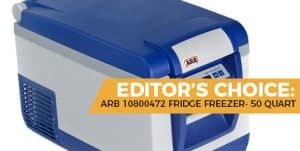 Our first 12-volt refrigerator is from ARB. This is a 50-quart fridge that is blue and light grey in color. This refrigerator comes with an AC power cable, a DC power cable and a set of mounting slides. This 12-volt refrigerator has enough room to fit up to 72 cans of soda. It also has enough length to fit multiple two-liter bottles of soda. To say the least, this fridge has plenty amount of space for all your food and drink. When you park our vehicle and no longer have any power available, the contents inside this refrigerator will remain cold. This refrigerator also offers a battery protection system, meaning that this product will not wear down your RV’s battery. You can be rest assured that your fridge won’t require much power to run, and that your RV won’t suddenly break down thanks to it. There are separate compartments to put dairy and fruit products, so you will not need to worry about fruits and drinks absorbing odors from one another. This fridge can keep contents as cold as zero degrees, which actually can freeze liquids. This fridge can be adjusted with electronic temperature settings, so you can set the internal temperature as cold as you need it. This is also an amazingly quiet fridge, that sounds very similarly to a home fridge. You won’t hear any loud droning, humming, or buzzing while this fridge is running, and that is just the way that RV owners want it. This refrigerator comes with a three-year warranty. This is a solid duration for a fridge that costs as much as this one does. If you find a problem with your fridge, you could be eligible for a free replacement mailed to you. The plugs that come with these refrigerators are insanely tight. Once you plug them into any sockets, they will take some Herculean strength for them to come out. You will need some loose sockets so that they can be taken out more easier when you need the plug to. Has a wide interior space. Comes with fussy power cables. 33 by 19 by 18.5 inches.. This 12-volt fridge is an upright mini fridge from Midea. This fridge is available in black, white and stainless steel, so you can choose which color of fridge you want. This is an upright fridge, meaning that it doesn’t function like a chest fridge. You can swing the door open and have you food right in front of you, but many people argue that retrieving food is easier with a chest fridge. Both types have their ups and downs. The top area is the freezer, it can chill items as low as negative 14 degrees Fahrenheit. It is great that you can freeze and refrigerate items at the same time, but both compartments still share the same door. This is the most affordable fridge in this review. It is considered a bargain as it is made for more than just camping and RVs, but for dorms and basements. There are many different sleeves, crispers and compartments to allow you to store and separate different food items. If you have drinks, meats, produce and more, they can all have appropriate places to go without throwing them into one big space. This fridge simply isn’t suitable for travel. Like the previous model from Whynter, you will always need it plugged in in order to still cool your food. As we have said with Whynter’s 12-volt fridge, we recommend getting a generator for portable energy. Needs to be plugged in all the time. The next 12-volt refrigerator is brought to us by Dometic. This is a black and stainless steel two tone product. This refrigerator comes with an AC power cable and a DC power cable. While there is a warranty, the details that the company provides are rather sketchy, especially the duration of the warranty. Dometic instructs you to contact customer support once any problem with your refrigerator occurs. This refrigerator promises low power consumption so that you can save your RV’s energy. It is also highly compatible with solar grids, requiring very little to get to cooling. You can fit as many as 47 cans of soda inside this refrigerator. While this is not as spacious as ARB’s refrigerator, there is still plenty of room to be found, and it costs significantly less in comparison. It has electronic temperature settings, just like the previous 12-volt fridge. It can freeze or refrigerate down to negative 7 degrees Fahrenheit, making it a super-effective refrigerator for doing what you need it to. Surprisingly, this refrigerator also has a USB port, so that you can charge your phone or other electronic device. Again, it does not require much power to give power to your smartphone. Included with this refrigerator is a removable wire basket, so you can separate fruit, vegetables or other items. If you take the basket out, you can have more room in your refrigerator. The one flaw that this refrigerator has is that it is very noisy. It hums rather loudly for a portable refrigerator. After experimenting with this model, we can’t help but think that it is supposed to hum. Apart from that, we would really appreciate a definite warranty period, rather than have it remain a mystery until we contact them. 25 by 18.5 by 15.5 inches. Engel is the maker of the next 12-volt refrigerator. More resembling of a cooler, this refrigerator has a light gray body, a dark grey lid and a red trim. This refrigerator comes with an AC power cable and a DC power cable. This is a highly efficient 12-volt refrigerator, drawing just one to two amps per hour. This low amp draw makes this fridge a very appealing one compared to others that are on the market. This fridge can hold up to 40 quarts of food, which is a solid amount. If you tend to want to store grocery bags full of foods on the go, this fridge will have a proper amount of room for it all. Included with this fridge is a removable wire basket. You can use this basket to keep delicate items like cheese and fruit away from more odorous food items, so that they remain fresh and taste the same when you want to eat them. This refrigerator can allow you to set cooling temperatures down to 10 degrees fahrenheit, which is not the coldest compared to other refrigerators in this review, but is still brutally cold enough to freeze food and drink. It will take around three hours to freeze solid foods. The compressor is very vibration-resistant, so that everything inside the fridge is calm. With smooth operation, this fridge is sure to last longer than you would expect. Like Dometic’s refrigerator, the warranty details with this 12-volt fridge are rather sketchy. You have to call Engel’s customer service department when you see something wrong with your refrigerator, and get your warranty terms revealed to you like some drumroll moment of truth. We wish companies were more transparent with us. 21 by 20 by 18 inches. This fridge isn’t designed for show, but it definitely pleads its case for why you need it. This refrigerator comes with an AC power cable and a DC power cable. There is a “fast freeze” mode, which means that this refrigerator can freeze contents faster than most other 12-volt fridges for RVs. It can bring temperatures to as low as negative eight degrees Fahenheit, which is one of the coldest temperatures that these fridges can go. This temperature can be adjusted electronically. This fridge comes with not one but two baskets that you can remove. In order to organize your foods, you can use these baskets to separate foods so that they travel nicely and neatly. This is a highly affordable refrigerator for the RV. And for 45 quarts of storage, that definitely seems like a good value. Included with this 12-volt fridge is a one-year warranty. You have precisely one calendar year to find any error with this product so you can turn it in and get a new one to you for free. The thing you need to be aware of is that you always need the fridge plugged in in order to keep food cold. It won’t stay cold for a little white after you plug the unit out. With that, we recommend purchasing a portable generator along with this fridge. How much electricity does a DC powered refrigerator use? Even though many fridge manufacturers describe that their product’s maximum power draw is, they do not explain how much power in a day that the refrigerator needs or will use. One thing to remember, though, is that the compressor does not run all day. When the food compartment warms up, the motor in the refrigerator will start running. The motor turns itself off when the fridge has a cold enough interior temperature. Over a span of 24 hours, a refrigerator that draws about two amps per hour will drain 48 amp hours from the battery. However, you do not want your battery fully drained, so in light of this, determine how much charge your battery has by taking your energy usage and multiplying it by two. If you want a clear-cut answer, you would like to have a minimum capacity of 100 amp hours, plus additional hours for other electrical loads, such as a blender, microwave, toaster, etc. There are multiple ways that you can charge your batteries, but the best way in our opinion is with what is called a battery isolator. A battery isolator draws power from your RV or trailers alternator. If you have additional cash to spare, you can also purchase a solar panel kit so that you get a cool fridge thanks to sheer sunlight. How Do You Know What Fridge To Buy Without An Accurate Amps? Even if you do not know how many amps a 12-volt fridge can draw, you can still have good faith from looking for how energy efficient the refrigerator is. Terms like “low amp draw” and “energy efficient” are phrases that should assure you that the model doesn’t need much energy to run. If you have the money for a solar panel kit, we truly recommend it. Running a 12-volt refrigerator off of solar power means that you will not be taking any power from a traditional battery. Solar panels collect energy from the sun and then convert that energy into power that is suitable for home and RV use. A few things to point out about solar energy is that you will draw the most energy from solar panels during certain times of day and when the panels are facing a certain direction. For refrigerators only, it doesn’t really matter which direction the panels face, they should collect enough power either way. If you are looking to power other equipment and appliances, place the solar panels in the direction that the sun sets, as lights, television and other appliances are often used only at night time. Chest fridges and upright fridges both have advantages and disadvantages over one another. Chest fridges are considered more portable, more convenient, can be sat on and have better energy efficiency. Upright fridges are familiar to traditional refrigerators, don’t occupy much space, are typically lighter and are less expensive compared to chest fridges. Dual zone fridges are refrigerators with two divided sections, so you can store two different things that you want to keep separate, like meat and soda, for example. Single zone fridges have one large interior, and typically have more space to put things thanks to a lack of a divider. To determine which type of refrigerator you need, just answer the question of what you need more: Space, or division among your foods. The best 12V refrigerator is none other than the ARB 10800472 Fridge Freezer- 50 Quart. This refrigerator simply is the best one that is catered to your RV needs. When you go off the grid with this fridge, your foods will stay cold for a period of time before you go back on the grid. It simply makes life on the road easier and reduces multiple hassles when handling fresh foods. This is a costly RV, but wee feel that it is well worth the money. It has lots of space for you to store foods, and the warranty should work well in your favor in case something fails well into your second or third year with it.